Navigating the cellular highways of skin cancer is a complex journey and Professor Xu Dong Zhang is a driving force in mapping the pathways of melanoma that have, until recently, remained a mystery. One of the world's most eminent researchers in skin cancer, University of Newcastle's Professor Zhang discovered a molecular pathway that has the potential to save the lives of people diagnosed with melanoma, the most dangerous form of skin cancer. More than 130,000 melanomas are diagnosed worldwide with 1,500 Australians dying from the disease each year. Australia holds the unfortunate title of the highest incidence of melanoma in the world. In 2013, Professor Zhang was the Chief Investigator for an international collaboration that unearthed a molecular pathway that plays an important role in the development of melanoma and its resistance to treatment. "There are tens of thousands of genes in every cell so discovering the important ones is an art. It takes a lot of work and lot of faith but Xu Dong has a knack for picking the right molecules," said fellow University of Newcastle cancer researcher, Dr Rick Thorne. Cancer is caused by the uncontrolled division of cells, which can invade adjacent tissue or travel through the body in a process called metastasis. In the majority of cases, cancer researchers look for deregulated genes that drive cell division. Using a combination of molecular and cellular biology and biochemistry techniques, Professor Zhang's recent discovery captured worldwide attention because it showed that a lack of molecule called PIB5PA in the cells – rather than a surplus or mutations – could be a major cause of melanoma. "This finding changes not only the way we view melanoma, but could also have significance for other kinds of cancer," Professor Zhang said. The PIB5PA molecule helps keep the cell normal and regulated and this loss activates a chain reaction called the PI3K/Akt pathway which occurs in up to 70 per cent of melanomas. Professor Zhang and his team found they could inhibit the growth of melanoma cells, and even shrink established melanomas by restoring PIB5PA levels. "The molecule was commonly absent in melanoma cells. By restoring its expression, it actually made the melanoma cells behave more normally and this happened straight away," Professor Zhang said. "Currently there are no effective therapies for metastatic melanoma - except to cut it out. If the cancer travels beyond the original site the patient's chance of surviving is not good. The PIB5PA discovery provides a potential new treatment." Professor Zhang said his team is now exploring targeted approaches to blocking the Akt pathway and hope they will have a new melanoma treatment within the next few years. "We'll also be exploring whether PIB5PA can serve as a biomarker for likely progression of some melanomas," he said. Head of the Melanoma Research Laboratory at the University of Newcastle and Calvary Mater Newcastle Hospital, Professor Zhang has spent the past 15 years searching for a cure for metastatic melanoma. The PIB5PA breakthrough builds on Professor Zhang's other ground-breaking discoveries in the field that have led to his reputation as a global leader in melanoma research. These breakthroughs include a significant contribution to understanding the resistance of melanoma cells to apoptosis, a form of cell death that is the main mechanism used by therapeutic drugs to kill cancer cells. 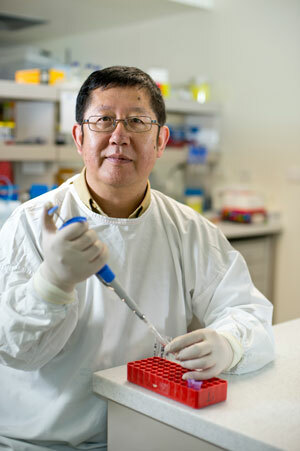 Professor Zhang also pioneered two areas of melanoma research, overcoming resistance of melanoma cells to apoptosis induced by TNF-related apoptosis-inducing ligand, otherwise known as TRAIL (a soluble factor that can be produced by immune cells and selectively kill cancer cells without affecting normal tissues) and examining the response of melanoma cells to a cellular stress condition called endoplasmic reticulum (ER) stress. "Skin cancer is complex, it's difficult and it's a huge challenge, but every step we take is one step further towards realising a molecularly designed personalised therapy," Professor Zhang said. "There are so many pathways, proteins and molecules within the cells. If you interfere with a few pathways you may temporarily stop melanoma growth. However, within a very short period the patient will relapse and the tumour will return. So we need to find more pathways and more proteins and develop more therapeutic approaches." "Adding to this is the fact that no melanoma cells vary wildly. Even within a tumour, they may be different from one another." "It's a race against time trying to blocks the pathways. It's like navigating the LA Freeway. We need to learn as much as we can about the different routes and shortcuts cancer can take so we can learn where we need to place the stop signs for cancer and what that flow-on effect will be." Originally a cancer surgeon in his homeland of the Shanxi region in China, Professor Zhang was fascinated by the complexity of cancer biology when he chose to switch his scalpel for study books in 1995 to pursue a career as a researcher at the University of Newcastle. "I worked as a surgeon for ten years in China before I came to Australia. I know how difficult it is to treat a cancer patient and because I understand what is really needed by a patient, my research has a strong translational base," Professor Zhang said. "The more you know about cancer biology, the more you feel how big the challenge is we have to face. It's a huge mountain and climbing that is what drives me." 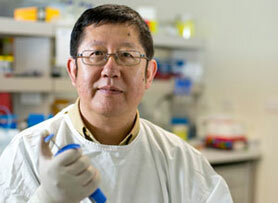 The Co-Director of the Priority Research Centre (PRC) for Cancer at the University of Newcastle and Deputy Director of the Cancer Program of the Hunter Medical Research Institute (HMRI), Professor Zhang said the key to their success in translational research was its collaborations with leading research institutions and universities. Professor Zhang is leading a number of comparative studies on the biological characteristics of skin cancer cells between Chinese populations and Australian populations. "In some melanomas in Caucasian populations like Australia, they often have a BRAF gene mutation. However, melanomas in Asian populations don't commonly have a BRAF mutation," Professor Zhang said. "This is important research because Asian and Australian populations might respond differently to treatments due to biological differences," he said. "The University of Newcastle's collaboration with leading universities in China has enabled us to open up new ideas and share resources, such as tumour tissues. We have co-authored at least 30 publications in high quality journals together, with more to come." Professor Zhang credits the integrated medical academic hub with the Melanoma Unit of the Calvary Mater Newcastle Hospital and the University's close association with the Melanoma Institute Australia as also vital. "Through our links with the Melanoma Institute of Australia the research team has full access to the largest repository of melanoma-related bio-samples with linked follow-up data in the world. From here, Professor Zhang and his team will be researching what regulates the sensitivity of melanoma cells to cell death induced by targeted therapy. They will also be exploring why the tumour suppressor p53 does not function to suppress melanoma and whether there is any relationship between obesity and melanoma development, progression and resistance to treatment. As Professor Zhang says, "we'll keep exploring until one of these pathways leads us down the road of stopping melanoma in its tracks."